"One could say that ever since Joseph Beuys adopted thetheses of Rudolf Steiner, the author of a series of famouslectures about bees, the importance and symbolism of theseinsects has been widely examined by contemporary artists.Beehave project conveys and recaptures this interest,showing a selection of works and installations by artists fromdifferent contexts who have addressed the subject of beesin all its breadth and complexity. Bee Writingsis presented as a compilation of essays commissionedwith the aim of charting a theoretical framework forthe exhibition, but it is only the first part of a broader publishingproject. Likewise, the exhibition is only the first chapterof Beehave, which unfolds all around the city of Barcelonathroughout a programme of art-related events focused on theimportance of pollination for the preservation of biodiversityand the state of environmental emergency that we arecurrently experiencing. 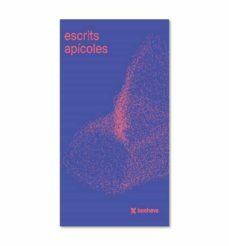 Texts by: Martina Millà, Xavier Theros, Domenic Leo,Jordi Bosch, Jaume Cambra and Anna Febrero "